A good plate lunch can be the difference between a good afternoon and a strung-out, digestively rugged one. Really good plate lunches require decent portions, comfort foods and experience. 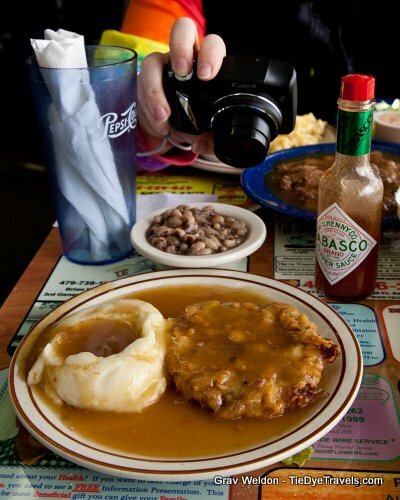 All those things can be found at Eunice’s Country Cookin’ and Soul Food in Fort Smith. 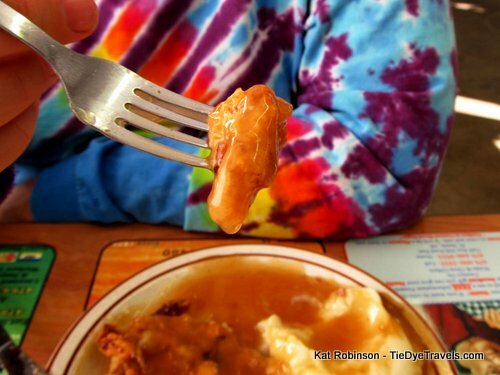 The restaurant has been in operation since 1976, first over on Jenny Lind near Ramsey. The old place burned down in 1997, but the owners rebuilt out east off of Rogers the next year and it’s been open ever since. 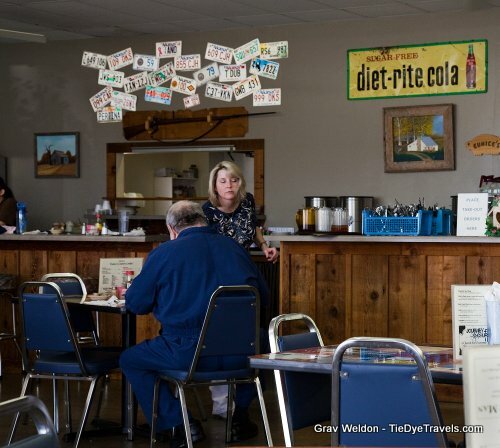 The interior is blue — blue walls, blue chairs and ad-covered tables, the sort of tabletop you find in locally owned places that have good ties to the community. The décor is more old country home than country splendor, emphasizing old items like an ancient stove by the door and an old iron bike on the wall. 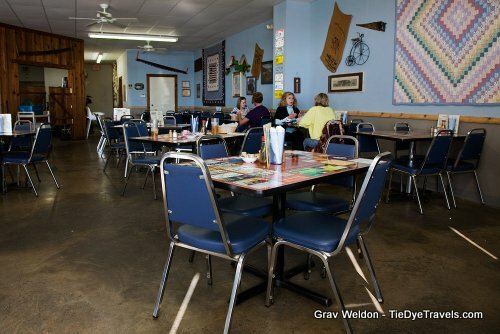 There are pretty quilts, and the kitchen itself is back behind saloon doors. There’s a simple menu that covers just about everything you might need in a plate lunch. The regular plate lunch is $6.41 with one meat and three sides, the mini $4.58 with just one side. Each comes with choice of roll or cornbread. 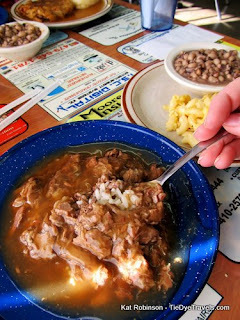 Other menu items include sandwiches (BBQ Beef, Chicken, Sloppy Joe, Meatloaf), salads and Beans & Cornbread ($2.75). Chili is offered seasonally November through February. Grav and I dropped in for a little comfort food on a Monday afternoon. We placed our orders with the waitress, who told us she’d be back in a moment. She wasn’t far off — less than a minute later she delivered the small salads we had both ordered. I was envious of the blue cheese dressing Grav had chosen — it appeared to be made in-house, unlike the Thousand Island I had chosen. 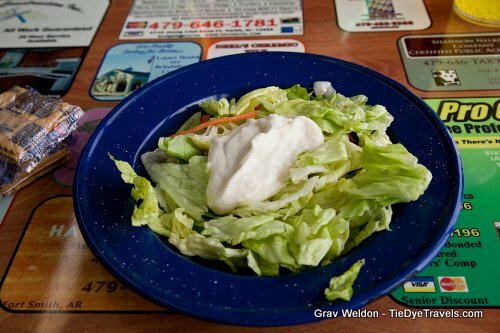 Both salads were iceberg lettuce and carrot shreds served with crackers. One more minute and we’d received our food. 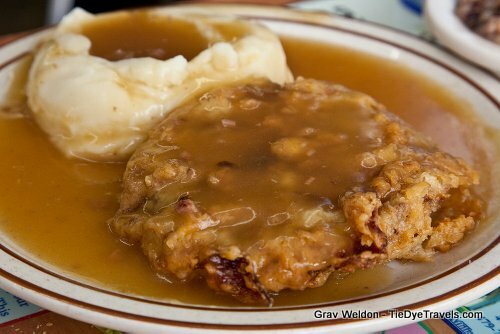 He had chosen the Chicken Fried Steak with Brown Gravy (white is also available) as his meat, along with a side of mashed potatoes. The chicken was especially golden under the golden brown gravy. The crust was crisp with a nice savory batter over carefully tenderized beef, not too salty and very filling. The steak was a little larger than normal but manageable. I had chosen an old favorite, Beef over Rice, and was pleased to receive a huge bowl of beef served up in gravy. The rice was completely concealed underneath the brothy blend. It was especially hearty and filling. 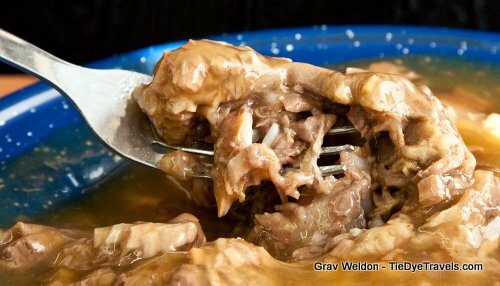 Other meat items include meatloaf, ham, roast beef with gravy, grilled chicken breast, Polish sausage with kraut, goulash with cheese and a daily special — which on this particular day was Beef Stroganoff. I’d chosen macaroni and cheese as one of my sides, and it was deliciously ugly — I mean, it was delicious yet ragged in the way good baked macaroni tends to be. 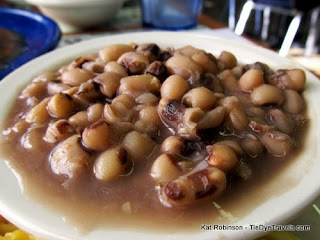 Grav and I both ordered up black eyed peas as our third side — being so close to the New Year it was a no-brainer. The peas were slightly sweet but required a little salt (for me) and Tabasco (for Grav). 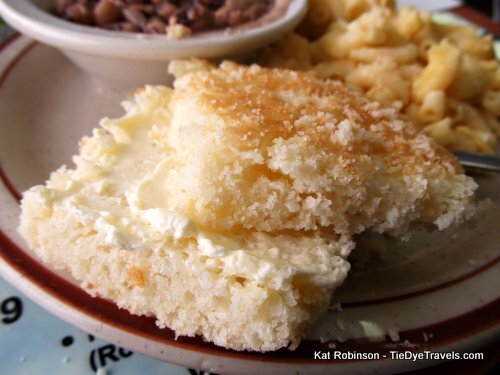 They went perfectly, though, with the sweet white cornbread delivered along with our entrees. The squares are a little dry but combined with some of those peas or topped with some margarine they’re excellent. 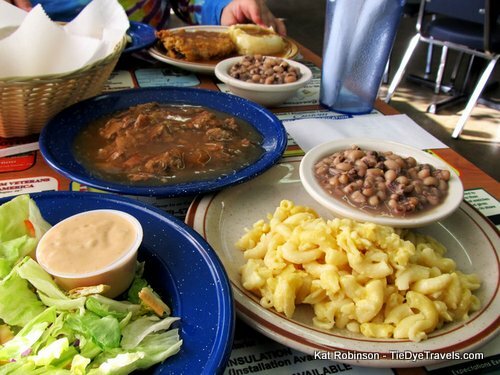 There are a lot of other choices for side items, including sweet and sour slaw, pinto beans, green beans, turnip greens (sweetened — but why? ), glazed carrots, cottage cheese, white rice, apple sauce and corn. The portions are so large, though, that dessert is uncontemplatable. Among the selections were coconut cream pie, cherry cobbler, chocolate pie, cheesecake and pecan delight pie. I’d had every intention of trying one of the desserts, but it just wasn’t happening. I was stuffed, and I didn’t even make it all the way through my beef and rice. The whole meal, drink and tax, came to $8.75. That’s not bad. What’s even better is the deal for parents. Eunice’s offers a High Chair Plate of three side items for kids under three years old for free. 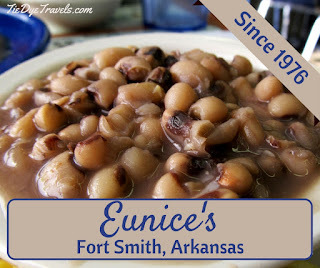 You’ll find Eunice’s at 3325 S.74th St next to Sam’s Club, less than a block off Rogers Avenue. 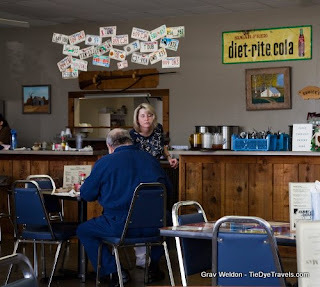 The restaurant is open only for lunch, 10:30 a.m. to 3:30 p.m. Monday through Friday. The phone number is (479) 484-1465 and there is a Eunice‘s Facebook page.